Chop the candies and keep in a bowl. Melt the chocolate chips in the microwave. Start by heating the chocolate chips in a microwave safe bowl or glass measuring cup for 30 seconds and then in increments of 15 seconds till melted. Stir and scrape as required. Spread the melted chocolate on the parchment lined cookie sheet using a rubber spatula. 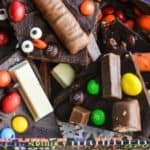 Arrange the chopped chocolates on the melted chocolate layer while it is still warm and gooey and throw in the M&Ms randomly. Refrigerate for 45 minutes to about an hour till the chocolate hardens. Cut or break into desired shape/size. Store leftovers in an airtight container.